← How is the War on Drugs Going? For years during my misspent youth all I knew about cannabis was that it made you feel good when you smoked it, it was a great social drug with the obligatory passing round of the joint at parties, and best of all it wasn’t physically addictive at all. So you could have a high old time on it, get a good night’s sleep in, and wake up for work the next morning no problem and have complete function of mind and body (unlike some other drugs I could mention; some legal, some not).. The older I get though, the more I’m learning just what a wonderful and diverse plant cannabis is, which in turn has got me scratching my head wondering why on earth this plant has got such a bad rap over the last 100 years or so. It used to be a widespread commercial plant until it was outlawed over 100 years ago by the governments of the day, and that is where our dependence on fossil fuels began. If it had been kept as a commercial plant we would almost certainly be running our industries using hemp oil products, our cars would be run on the same stuff, meaning far less pollution of our planet caused by the over-mining of the scarce fossil fuels. Not to mention the wide application of cannabis in the medical field. However, becuase this plant was made illegal all those years ago the scientific applications surrounding this plant have been very much restricted, and as the years have rolled by the world populous as whole has been brain-washed by the powers-that be into thinking that this plant is evil and oil is king. It’s all to do with money and control, and it’s only been recently that certain medical breathroughs are becoming apparent – a cure for Alzheimers? Assisting in easing, and even reversing the symptoms of Diabetes? A help for Bulimia and HIV sufferers? A potential aid for various cancers? Yes, there is scientific evidence out there backing up all these claims. So why oh why are we not going hell for leather trying to use this plant to help the human race? I personally see the mindset surrounding the vilification of cannabis changing within our lifetimes. As fossil fuels continue to dwindle, people will be looking for a replacement to run our industries and power our cars, and commercial hemp will almost definitely feature in a big way. My hope is that people power will prevail and the people in charge will have no option but to listen to the masses. And of course with all this medical breathroughs in the use of marijuana to treat various ailments will be properly explored…it’s just a shame that we are leaving it so late. Free the weed and everything else will follow! 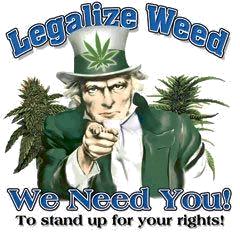 This entry was posted in General and tagged cannabis, commercial hemp, hemp, marijuana, medical. Bookmark the permalink.